Description of "Are you being bullied?" Bullying is the most traumatic experience a child might face outside the home. Studies show, every third child is bullied at school. Some children put a brave face, but some others might get hurt to the extent of suicide. Hitting, pinching, teasing, name calling, leaving out from groups, gossiping, social bullying and cyber bullying are common types of bullying. This book consists of day to day bullying incidents where children get tools to identify and overcome bullying. Activities and games listed in the stories are fun and can be practiced at home or school. 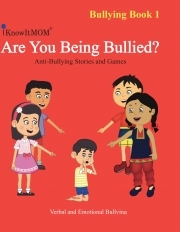 This book encourages children to talk about bullying. It answers the most important question all bullied children ask , "Why me?" Chetana is an engineer, animator, story teller, entrepreneur and a mother. She has keen interest in psychology and she loves children. She has great success in combining development psychology with storytelling. She is a certified storyteller and certified in parenting from Yale University. She is also founder of IKnowItMOM Pvt. Ltd. Specialty of her stories is to teach children difficult topics without sounding like preaching. Ishwara Bhat has 20+ years of experience in the software industry. He has worked in multiple oversea locations and had studied cultural impacts. He has vast experience in hiring and doing performance analysis of people. He believes learning essential life skills and soft skills in the childhood can make people more successful in the corporate world. His vast experience can be seen through his popular blog www.midmanager.com. His stories improve emotional intelligence in children. Reviews of "Are you being bullied?"